Mycenaean Chariot crater with woman dressed in Minoan fashion. The Swedish Cyprus Expedition excavations at the Late Bronze Age site of Dromolaxia-Vizakia (Hala Sultan Tekke), close to Larnaca International Airportand the famous homonymous mosque, continued to expose City Quarter 1 (CQ1). There are three city quarters (CQ1-3) in the northern and north-western part of Hala Sultan Tekke, the size of which may have been as large as 50 hectares. These three city quarters are separated from each other by streets. 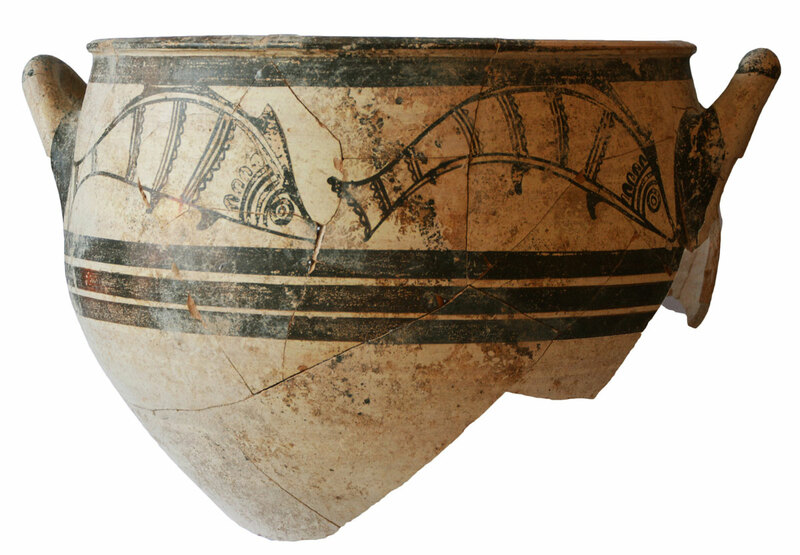 Based on the pottery, the life span of this Late Bronze Age city was from roughly 1600 BC to 1150 BC. At around the mid-12th century BC the city was destroyed and abandoned, never to be occupied again. The extension of CQ1 was guided by the results of three sophisticated ground penetrating radar and magnetometer surveys. These surveys were carried out within the framework of a collaborative project between the University of Gothenburg and the University of Vienna, the team of the latter headed by Dr. Immo Trinks. The georadar results, ­which were supported by magnetometer measurements, suggested that the already exposed stone-built compound in CQ1 continued further south, i.e. outside the previously fenced Area 6. Consequently, the fence was moved 15 m to the south in order to completely expose CQ1. The preliminary results from 2016 (and earlier years) point to three occupational phases in CQ1: Stratum 1 (most recent), 2 and 3. Unfortunately, farming activity has affected Stratum 1. According to the pottery, the uppermost two strata date to the 12th century BC. However, 13 radiocarbon dates of samples were taken from these two strata, which indicate that these dates could be raised to the second half of the 13th century BC or, at the latest, shortly after 1200 BC. These results demonstrate, once again, that both occupational phases ended with catastrophic events as indicated by layers of ash and shattered architectural structures. The structures found in Stratum 1 indicate that the area was used for the storage of grain and liquids and the remains of several large pithoi (storage vessels) were recorded. Evidence shows also, that working and cooking took place on-site. A bath tub of fired clay was used during this phase of occupation. 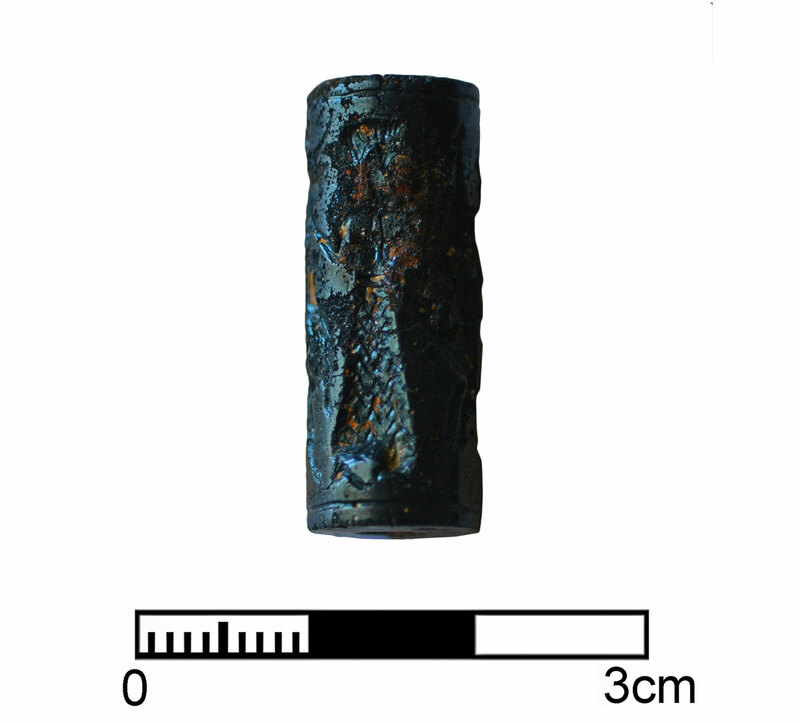 Amongst the more spectacular finds from this phase is an Egyptian-made, faience button. Stratum 2 which is in a much better state of preservation consists of several well-constructed rooms. Amongst the building elements are (reused) ashlar blocks of stone. Finds from Stratum 2 include several wall brackets and Mycenaean-imported pottery of which only minor quantities were uncovered. Below Stratum 2 lie large walls, proving the existence of an even older phase of occupation. At present there is no detailed information concerning Stratum 3. Parallel with the excavation in the city, additional excavations took place in Area A. This area, where excavations were carried out during previous years (2013-2015), is roughly 500 m east of CQ1 and close to the mosque of Hala Sultan Tekke. Again, the decision of where to excavate was guided by geophysical prospecting which demonstrated the presence of 83 “pits” within an area of one hectare. Previous excavations have shown that these “pits” are ancient wells, tombs and offering pits which all are dated to the Late Cypriot period (1500-1200 BC). Two of the pits excavated this year were wells (Pits S and T). Pit V turned out to be an offering pit, in the shape of a lying “8”. It contained a large amount of sophisticated pottery (roughly 70 vessels), much of which was Mycenaean-imported. However, no skeletal remains were found so the preliminary interpretation is that it was an offering pit. 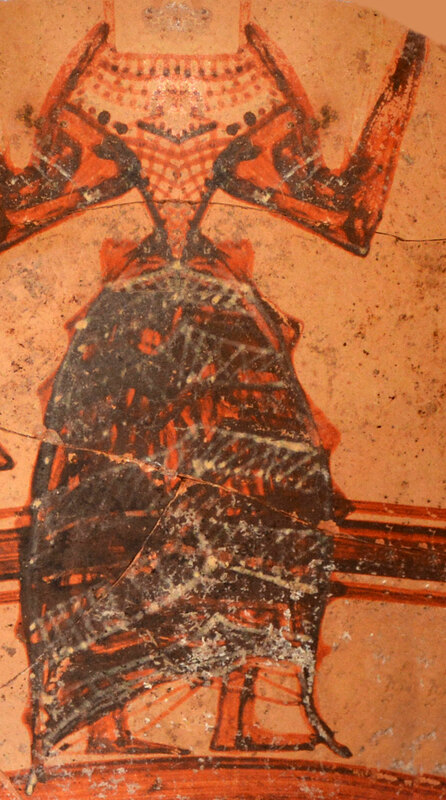 Amongst the vessels are some rare chariot kraters of exceptional quality and a krater with the image of a woman clothed in a sophisticated long dress of Minoan fashion. This offering pit has preliminarily been dated to the 14th century BC. Pit X, turned out to be a very rich, possibly family, tomb. Like Pit V, this tomb is also in the shape of a double-pit resembling a lying “8”. The disorder amongst the huge mass of finds and the skeletal remains of this tomb indicated that it was reopened at some point in antiquity. 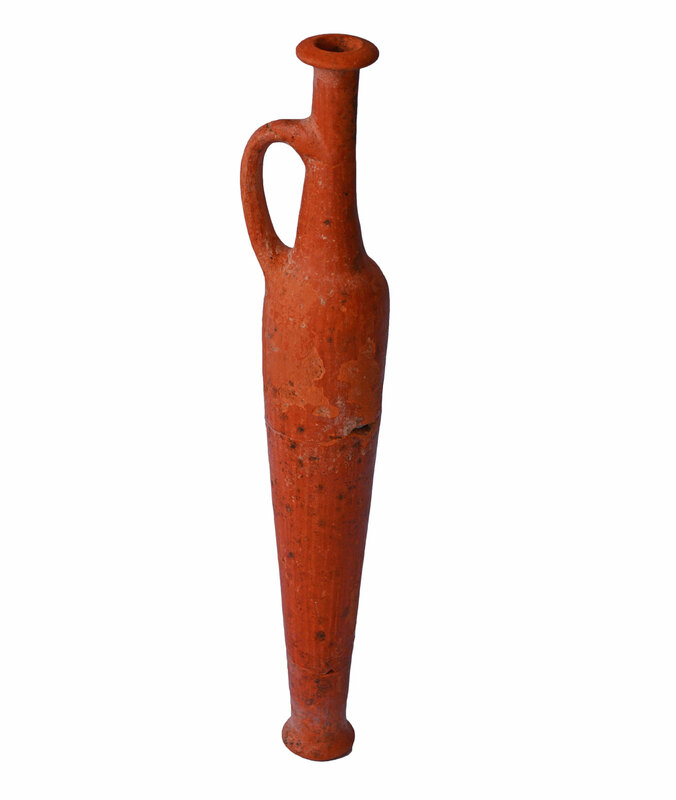 The pottery repertoire consisted of roughly 70 complete vessels, among which were vessels of Base-ring ware, White Slip I and II wares, Red-Lustrous Wheel-made spindle bottles and bowls and numerous Mycenaean imports. Amongst the latter is a jug dated to Late Helladic IIA (roughly 15th century BC) which would make it one of the earliest Mycenaean imports to Cyprus. Other finds include jewellery, such as earrings, beads and a decorated headband, as well as numerous carnelian beads. 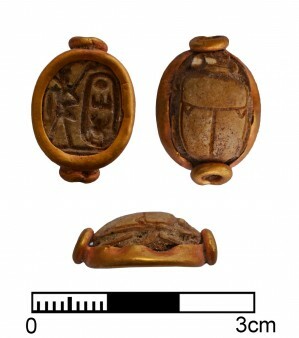 Amongst several scarabs are two which are mounted in a metal frame, one of which is of steatite and the other of faience. The steatite scarab has white inlays for the eyes which is very rare. This scarab is incised with the hieroglyphic signs “men-chepher-re” together with the image of the pharaoh to the left: this arrangement corresponds to the cartouche of Tuthmosis III (1479-1425 BC). Another find which should be mentioned is a complete bronze dagger. The team’s preliminary conclusion is that the family tomb and the offering pit, both of the same shape of a lying “8”, are associated with each other. The 2016 excavation results confirm that the architectural remains in the settlement in and around Area 6 (CQ1-3, and Area 8 and annexes) date to the 13th-12th centuries BC but the pottery from Stratum 3 seems to be older. However, the pits, tombs and wells recorded in Area A are of much earlier date (15th-13th centuries BC), which raises the question of where the settlement was? Additional geophysical prospecting in the area between Area 6 and A followed by excavations could possibly provide an answer to this question. The excavations were headed by Professor Peter M. Fischer (University of Gothenburg) and carried out during five weeks in May and June 2016.